New Outremer 5X Catamaran Launched for Just Catamarans Client in France. Outremer Catamarans just launched the newest 5X, named BLUE NIMBUS for Just Catamarans client Dr. Robert Dunmire. 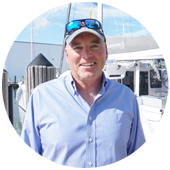 The 5X catamaran was sold by Outremer specialist and Just Catamarans broker Robert Taylor. Regarding the sale of the Outremer 5X, Robert Taylor said: It was a great team effort from initial sales, to involving Stuart and Jan and their expertise, Matthieu at Outremer, and the rest of the team at LGM. A special thanks to Just Catamarans Service Manager Raf Escobar, whose input in early discussions with the client, who is also a pilot, convinced him our electronics expertise would have him in good hands in making decisions for his new 5X. 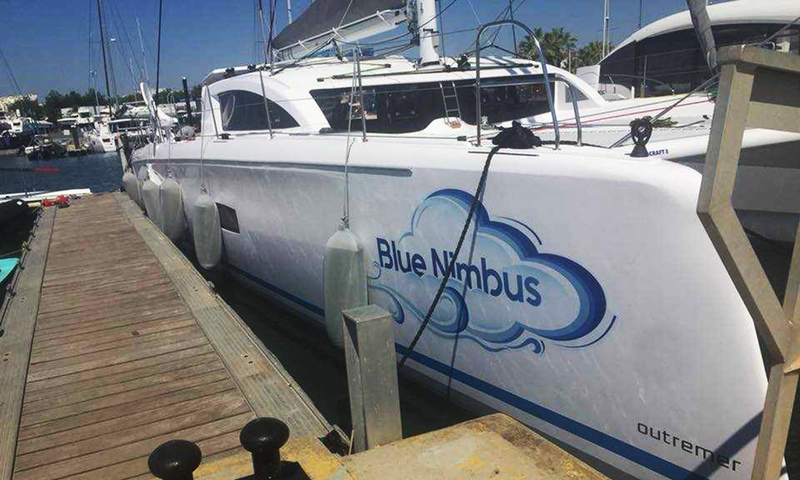 BLUE NIMBUS was commissioned by our friend Jan Cluistra at La Grande Motte (special thanks for the photo). In the process of finding the right catamaran, Just Catamarans client Dr. Robert Dunmire performed a test sail on an O-51 along with Jan Cluistra and Robert Taylor. Big smiles all around convinced Dr. Dunmire to place an order for a new Outremer 5X.